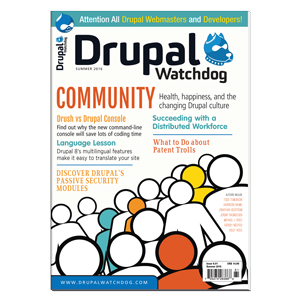 Full-color advertisement sizes are available for Drupal Watchdog's print magazine which is released twice annually at booksellers like Barnes & Noble and at US and EU DrupalCons around May and September. Click any advertisement size for more information. Purchase multiple advertisements together for a 15% discount. Contract print advertisers are also eligible to place Web advertisements. You can sign-up here if you would like to receive future Drupal Watchdog advertising promotions. View our Media Kit for more information. *Ad placement must be purchased or reserved by this date. *Ad artwork must be received, via email, by this date. Images should be in high-resolution PDF format and at least 300 pixels per inch. All bleeds should exceed the final trim size by a minimum of 1/8" on all sides of artwork. All copy should be kept to a minimum 1/8" from final trim. Black TEXT must contain only black (no Cyan, Magenta or Yellow, no RGB black). * Prices on this page are provided for example only and are subject to change. Choose an advertisement size to see finalized prices.